As someone who tends to roam race weekends with a photo vest, I understand the need for photographers to capture not only great shots of cool cars, but the atmosphere as a whole. What goes on in the paddock? What do the people do between on-track sessions? Is there a human element to this madness? Those are all essential to capture in photos. 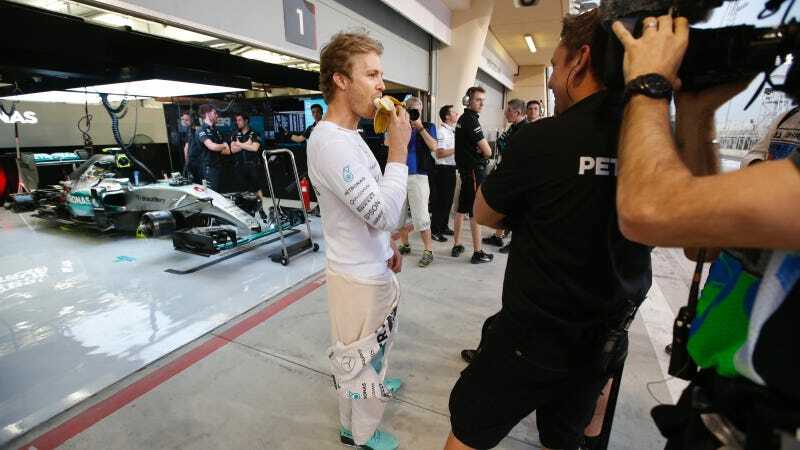 At Bahrain, Rosberg ate a banana. See? Rosberg is a normal banana-eating dude, just like the rest of us. (Well, the rest of us who like bananas.) Perhaps it was this elongated piece of fruit that’s given Rosberg the extra aggression he’s shown during the race today. That’s unlikely, but who knows? Either way, banana lovers everywhere now have a favorite driver.